Daily Mass will be arranged depending on priest availability and location preference. Today we embark on our journey to the lands of ancient treasures and Christian history with an overnight flight to Greece. Meals and beverages are served in flight. Today we arrive in Thessaloniki and check into our hotel. You will have the remainder of the day at leisure to relax or take a stroll along the streets of Thessaloniki to enjoy the flavor of the city. Dinner and Overnight in Thessaloniki. We begin the day by following the massive battlement Byzantine wall to the citadel for a panoramic view of the city. Next, we visit Philippi and Kavala. Kavala is Greece’s picturesque mainland port with a most elegant harbor and the site where St. Paul landed with his disciples, Timothy and Silas. Luke, the Evangelist, also came here from Troas. This ancient city of Neapolis was later renamed Christoupolis because it was the first European city to accept Christianity! We then tour the Roman Aqueduct and the ruins of the Acropolis in this beautifully located city, known since the 5th century as Kavala. We continue on to Philippi where Paul preached his first evangelical sermon and baptized the first Christians on European soil. We then view the baptismal site where Lydia surrendered her life to Christ and visit a crypt dating from the Roman period that is thought to have served as a prison for Paul. Finally we visit the famous Acropolis, the Market Place, Basilica, and the Theatre. 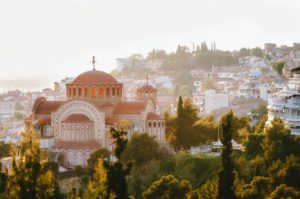 We return to Thessaloniki and visit St. Demetrius Basilica, dedicated to a distinguished member of the Roman army and a martyred Christian convert, before returning to the hotel for dinner and overnight. This morning we begin by visiting the Thessaloniki Catholic Cathedral before we depart form Thessaloniki. We then drive through the town and see remnants of the original Roman road that spanned the nation during Paul’s time. En route we will view the old city ramparts; the newly excavated Forum, St. George Church, an ancient Roman monument which was transformed into a church and the Galerius Arch, which rises over the famous Via Egnatia. We then continue to Berea to view the ancient synagogue where Paul spoke and the view the mosaics of Paul and the plaque of scripture regarding the “more noble” church. Dinner and overnight Kalambaka. Following Breakfast this morning we begin with our tour of the Meteora Monasteries. 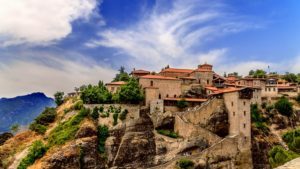 Here we see the world famous Byzantine monasteries that are perched precariously on summits of gray rock pinnacles of varied and beautiful shapes. Their history goes back to the 14th century when the monks sought refuge in the cliffside caves then fled higher to build the original wooden shelters, later transformed into monasteries. From here our tour travels southward past Thermopylae where we learn of the famous Spartan battle of 300. Dinner and overnight in Athens. This morning we drive to Pireaus where we embark on our cruise ship. Our first port is at Mykonos, called the island of windmills. We experience the waterfront lined with shops and cafes and then stroll the charming walkways through a maze of whitewashed buildings before returning to the ship for dinner and evening entertainment. Docking in Turkey, we enjoy a tour of Ephesus, the city of the Bible and one of the largest restorations still in progress with miles of ancient treasures. Ephesus was once a thriving port town of 250,000 people. We see the spectacular excavations of the major streets in this ancient city including the Agora, the Odeon, the Library, the marble-paved main Street, the Baths, Trajan’s Fountain, the Residences of the Patricians, the Prytaneum, and Temple of Hadrian. We visit The Great Theatre, built in the 4th century B.C. and could accommodate 24,000 spectators and it is famous even nowadays for its acoustics. We then visit the House of the Virgin Mary in Ephesus. This afternoon we visit the Isle of Patmos, under statutory protection as a historic monument. 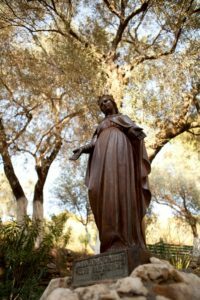 Here we have a optional tour to see the fortified monastery of St. John and the cave claimed to be where John received the Revelation. Back on the ship, enjoy dinner before settling in to your cabin for the night. There is an optional tour to Heraklion and the fantastic ruins of the Palace of Knossos. Discovered in 1899 and partially reconstructed, the elaborate Palace is believed to be the mythical Labyrinth of King Minos and the seat of ancient Minoan culture. This afternoon we visit the island of Santorini, which is considered the most breathtaking of all the Greek Islands. 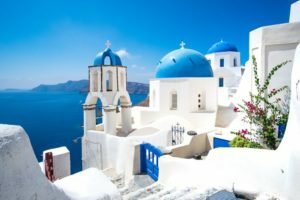 The town of Thira, where white-washed houses, narrow streets, open-air cafes and glittering boutiques cling to steep cliffs, is accessible by foot path, cable-car or mule. You may choose to take an optional tour of sailing around an active volcano crater and swimming in the water heated by hot springs or enjoy this lovely island on foot. Again we return to the ship for dinner and evening entertainment. We disembark the cruise this morning and travel into Athens, the foundation of democracy. 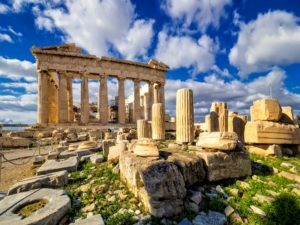 We visit the Acropolis, the Parthenon, and Erectheum before viewing Athens atop Mars Hill where St Paul stood and preached the truth to the Gentile nation. If time allows we visit the Agora (ancient market place and center of Athenian public life), the House of Parliament, the Tomb of the Unknown Soldier, Olympic Stadium, and Presidential Palace. We immediately travel west with a rest stop and photos at the Corinth Canal. We then travel to the ancient city of Corinth, another treat for the New Testament scholar. Corinth is the city that inspired many of Paul’s most familiar letters. We visit the Archaeological Museum, the Market Place, the Bema, and the Temples. As we walk along the stone path that St. Paul walked, we stand in the midst of the ruins of the church of Corinth and see the pillars, steps, and public worship place where Paul preached. We return to Athens tonight for our Farewell dinner and overnight in Athens.